Please type your desired tags, e.g. Geoscience, Information Theory, Bio-Organic, Computer Engineering, ChIP-seq, Consulting, Publishing, Hybrid Course Design, Operations Management, Healthcare Administration, Mathematics, History of Medicine, Communication, Culture, Poetry, and etc. 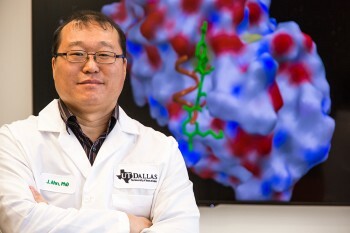 Dr. Jung-Mo Ahn, associate professor of chemistry at The University of Texas at Dallas, has designed and synthesized a novel, small molecule that might become a large weapon in the fight against prostate cancer. 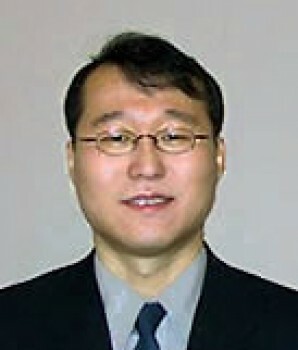 In a study published online May 28 in the journal Nature Communications, Ahn and his colleagues at UT Southwestern Medical Center describe the design of the molecule, as well as laboratory tests that show its effectiveness at blocking the cancer-promoting function of proteins called androgen receptors. Androgen receptors are found inside cells and have complex surfaces with multiple “docking points,” where various proteins can bind to the receptor. Each docking point has a unique shape, so only a correctly shaped molecule will fit.